Fixed an issue that caused Poisonous and Lifesteal effects to fail to trigger on side-minions if they’re hit by Sweeping Strikes or other Cleave effects when the initial target had Divine Shield. Fixed an issue that caused Sweeping Stikes and other Cleave effects to function incorrectly if a minion to the left of the original target had Divine Shield. Fixed an issue that caused “Bomb” cards transformed by Arch-Villian Rafaam to be briefly visible when drawn by the opponent. Corrected behavior of triclass cards. Triclass cards that include Rogue (such as Jade Spirit) no longer activate Vendetta or other Burgle cards. Why are bug fixes not posted in Bug Report forum? Rafaam + Shudderwock Draw Bug? Stealth nerf or announced but missed? Why the Triclass card change? Spectral Cutlass rogues finally had a chance to survive these retarded aggro face roll decks (IF all the right combination of cards land in your starting hand). Also how the hell are we supposed to fight with Spectral Cutlass rogue against other rogues? No chance in hell. they even in past changed them to work with a other burgle card, ethereal peddler. and these make lot more sense then arfus/lich king cards yet they also get replayed. Could you ignorants revert this stupid Triclass cards change? Thanks. Literally 90% of Wild players. Good job for ruining the fun and viability in wild once again, while completely ignoring the format otherwize. I’m seriously considering quitting this game because if stuff like this. Do whatever you need to balance standard and arena, but for that you don’t need to “correct” an interaction that has been araound for ages now. They didn’t change it for wild they changed it for arena, and even then it was still broken and not an intended feature. So I don’t know why you guys are complaining. Bad news, Dylan Bates ! if its for arena they should put in in high bucket or ban the rush adn vendatte from it. and it wasnt a bug it was intended; they changed in the past so tri class would work with burgle. you can still and could Always get them from burgle vs shaman and druid and so theyre cards from another class. oh adn it was far from broken in wild where theyre playable and in arena even without tri class working fence and vendatta are op as hell for it. SO no reason to change a mechanic and certainly not passing it of as a bug fix when its a nerf. Peddler has from another class, same as tess, same as cutlass,same as vendatta;same as fence. it was something that has been around since tri class excists in the game and was changed intionaly at time so it would work. So this a nerf. 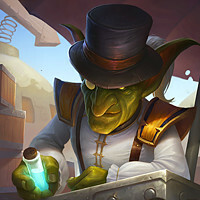 Make sure to accompany the bug with screenshots and/or hsreplay.net link, so Blizzard has all the information they need to be able to investigate it. If it was an intended interaction then they wouldn’t of patched it out. Point blank, you have no argument. Not to mention before we didn’t have cards that interacted like Angler and Venadta, so you can’t say this was a intended interaction. The only reason it slipped into the game was due to blizzard not testing wild. So get off your high horse and stop thinking you’re intiled to a dust refund or a revert. Their problem is interactions that have existed for a long while are affected by this like Tess summoning them or spectral cutlass triggering off them, so everything isn’t entirely new. I don’t play wild and definitely feel its important to make this change for arena but I understand the annoyance caused to those who have taken advantage of the interaction they never saw as a bug in wild. Blizzard should have fixed this long ago if it really was a bug when Tess and cutlass came out. “Interaction fix” This was one of the few ways to get a decent amount of other class cards in a rogue match, this is just nerf… fail. You act like you’re complete losing the tri class card, it still generates a discoverable Rouge/shaman/Druid card. When became tri class cards busted in burgle rogue? Lotus Agents was a card that you could nicely play on curve when you equipped Spectral Cutlass. When they got a 2 mana 3/4 with rush. And a 0 mana minion only eviserate on turn 1. So Underbelly Fence and Vendetta are the problem cards. It’s just bad designed, cause you can still play Hallucination and Swashburglar on turn 1 to trigger there effects on turn 2.